the evidence of your suffering? your name printed above the caverns for eyes. Not a dreamy diaphanous starlit night. leave only the soft moon to dimple your sky. Gail Goepfert is a poet and photographer and a teacher. She’s an associate editor at RHINO Poetry. Her books include A Mind on Pain, 2015 and Tapping Roots, 2018, and a third, Get Up Said the World, which will be released in early 2019 by Červená Barva Press. 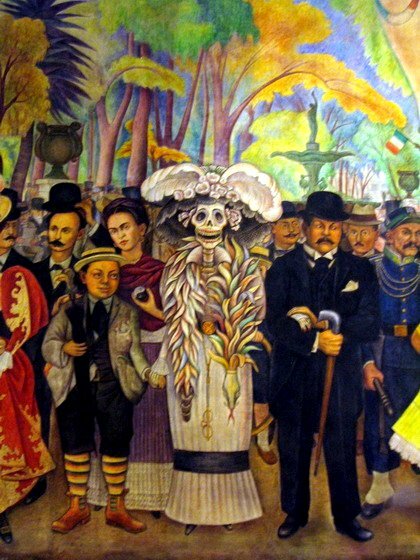 Image: “Dream of a Sunday Afternoon in the Alameda Central” by Diego Rivera. Mural. 51 x 15 feet. 1946-47. Restored after 1985. By free license.